In many laboratories, Single Photon Emission Computed Tomography imaging is the procedure of choice for nuclear cardiology procedures. Despite this, cardiac Positron Emission Tomography (PET) perfusion imaging has been recognized as superior to standard SPECT imaging due to higher image quality a greater efficiency . However, it has been infrequently used due to limited availability of camera systems, radiopharmaceuticals and technical difficulties in cardiac acquisition and processing. Recently, the number of PET Camera systems has increased substantially and acquisition, processing and display of Cardiac PET studies has vastly improved. Thus, since its introduction in the early 1980s , the use of Cardiac (PET) perfusion imaging has greatly increased within the last 8 years. 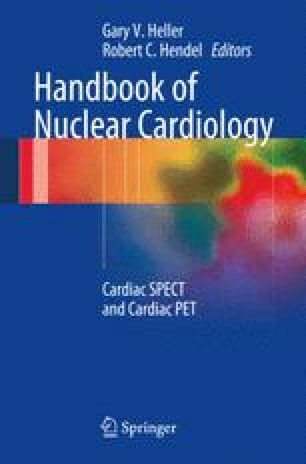 Its superior sensitivity and specificity over Single Photon Emission Computed Tomographic (SPECT) myocardial perfusion imaging , as well as the routine availability of Rubidium-82 (Rb-82), has made cardiac PET an important tool in the detection and risk stratification of coronary artery disease. This chapter will discuss some of the technical differences between PET and SPECT cameras, particularly as it relates to choice of technologies, and provide insights as to when PET might be preferable to SPECT for individual patients. A more detailed description of PET radiopharmaceuticals is provided in Part III ( Chap. 13) and PET instrumentation in Part III ( Chap. 14).